Experience rural life on the South Island with a visit to Walter Peak High Country Farm. This working sheep and cow ranch sits across Lake Wakatipu from Queenstown, along a section of lakeshore that is largely inaccessible by car. To get there, most passengers ride across the lake aboard the beautifully restored TSS Earnslaw, steamship. Guided tours of Walter Peak High Country Farm take visitors among highland cattle, goats, and sheep. Watch skilled sheepdogs corralling the herds before a shearing and wool-spinning demonstration. Strolling through the lush gardens along the lakeshore is a must before stopping at the Colonel’s Homestead to sip tea and eat scones around a roaring fire. If you arrive on the TSS Earnshaw, check out the open viewing area where you can see the original steam engines that power the ship. Tours of the farm can be combined with a steamship cruise on Lake Wakatipu and dinner on the farm. The farm is a not-to-be-missed experience for history buffs and families with children. The ship is wheelchair accessible on the main level. The farm is reached via a wide gravel path, and the sheep demo, restaurant, and gardens are fully accessible. Save money and combine the trip with a Milford Sound or Doubtful Sound nature cruise. Morning or afternoon tea is typically served on day tours, while a barbecue buffet dinner is an option for evening excursions. Additional food and drinks are available for purchase from the onboard cafe. The TSS Earnslaw offers several daily departures from the Steamer Wharf in central Queenstown; it’s easily reached on foot from downtown. The cruise to the farm takes about 1.5 hours. Walter Peak High Country Farm is open daily. The ship operates year-round, except when it’s under annual maintenance for a month or so each winter, at which time a smaller boat is used. Launched in 1912, the year of the Titanic’s maiden voyage, the Edwardian TSS Earnslaw steamship has carried royalty from Thailand, Japan, and Belgium, as well as Queen Elizabeth and Prince Philip of the UK. The TSS Earnslaw also had a moment in the Hollywood spotlight with a brief appearance in the 2008 film Indiana Jones and the Kingdom of the Crystal Skull. Cruise across Lake Wakatipu to Walter Peak High Country Farm aboard the SS ‘Earnslaw,’ a vintage steamship. Stroll the lakeside gardens to the Colonel's Homestead for traditional morning or afternoon tea and take a walking tour of the farm. You’ll watch sheep dogs in action, see sheep shearing demonstrations and learn the time-honored art of spinning wool. Treat yourself to home-baked goods and alpine views of the Remarkables mountain range. Savour a delicious afternoon tea and an amble through lakeside gardens before heading back to Queenstown by boat. Board the TSS "Earnslaw," a vintage steamship, for an evening cruise on Queenstown’s scenic Lake Wakatipu. 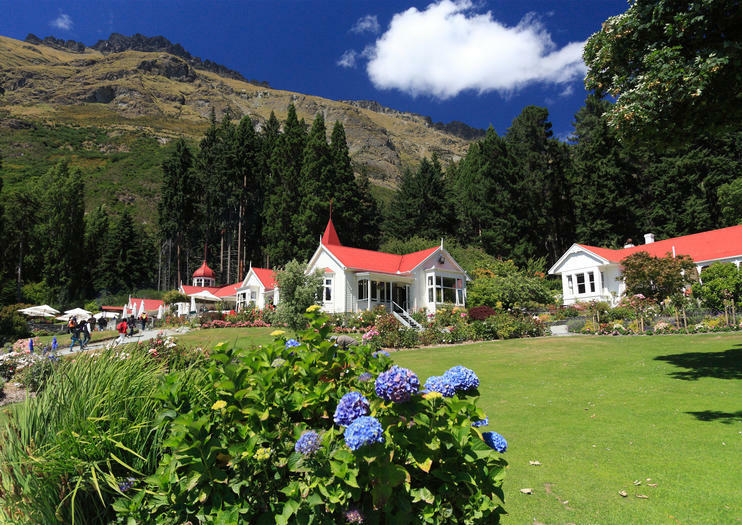 Arriving at Walter Peak High Country Farm, you’re treated to a sumptuous barbecue dinner at the Colonel’s Homestead. Sink your teeth into roasted meats and seafood, homemade desserts, and a New Zealand cheeseboard while a pianist provides the ambiance. After dinner, see farm demonstrations or purchase a drink and simply relax in the bar. Cruise from Queenstown to Walter Peak High Country Farm and venture out on horseback with an expert guide. You'll board the vintage steamship SS ‘Earnslaw’ for a round-trip ride across Lake Wakatipu then have morning or afternoon tea at the Colonel’s Homestead. Numbers are limited for a small-group experience on the horse trek, with views of the Remarkables mountain range. Cruise around two of the South Island’s most scenic waterways with this Queenstown Super Saver that takes place over two days. First, cross Lake Manapouri and Wilmot Pass to Doubtful Sound for a 3-hour catamaran cruise; search for wildlife in the pristine wilderness flanked by forested peaks and waterfalls. The next day, board a vintage steamship for a ride across Lake Wakatipu to Walter Peak High Country Farm. Enjoy New Zealand hospitality with morning or afternoon tea and get an up-close look at rural life.